National Kitchen & Bath Month offers opportunities for everyone. October always means falling leaves, football, and candy corn. For the construction industry, it also means National Kitchen & Bath Month. For the Iowa Chapter of the National Kitchen & Bath Association (NKBA), October is the perfect opportunity for growth. The NKBA, which is the premier association for kitchen and bath professionals, includes more than 60,000 members nationwide and hosts the annual Kitchen & Bath Industry Show. But one of the greatest benefits of NKBA membership is the education it provides to the industry. In addition to supporting industry events and trade shows, NKBA encourages and offers continuing education and career development for kitchen and bath professionals. “The professional education opportunities through the association are invaluable, even if you aren’t pursuing certification,” Hyde says. The NKBA certification program requires applicants to complete a minimum number of educational hours in order to receive certification, which is offered at three levels (see “NKBA Professional Certification and Education”). Certified members must continue their training by attending annual career development sessions on topics of their choice. To help members complete those education hours, the Iowa chapter is offering several events in conjunction with National Kitchen & Bath Month this October. The highlight program is scheduled for October 23 in Urbandale. “We have a series of presentations all under the theme of Designing the All-Inclusive Outdoor Kitchen and Living Area,” Hyde explains. The afternoon’s activities include appetizers, local wines, and craft beers. Presentations will cover outdoor kitchen design, outdoor living areas, landscaping for outdoor living, and more. “Outdoor kitchens and living spaces are one of the biggest growth areas in the kitchen and bath industry. So this is a great time to educate builders and remodelers and others in the kitchen and bath field about this growing niche,” Hyde says. Though membership in the NKBA is not required to participate in the National Kitchen & Bath Month events like this, the association hopes kitchen and bath professionals will take this opportunity to learn new skills and to learn about all NKBA can do to help their business. Established in 1963, the nonprofit National Kitchen and Bath Association includes distributors, retailers, remodelers, manufacturers, fabricators, installers, and designers. NKBA members from every aspect of the kitchen and bath industry benefit every day from the programs and relationships they develop as a result of their membership. 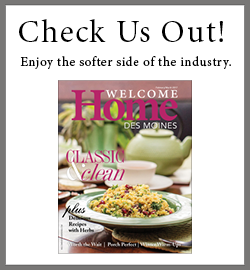 Through events like the outdoor kitchen design seminars, Hyde says the Iowa chapter hopes to see membership grow this month. And by attending these programs—and joining other professionals in the NKBA—you can grow your professional expertise and perhaps your business, too. Certification through the National Kitchen & Bath Association can be achieved at three levels: Associate Kitchen & Bath Designer, Certified Kitchen Designer or Certified Bath Designer, and Certified Master Kitchen & Bath Designer. In addition to work experience and a written exam, applicants must complete anywhere from 30 to 100 hours of NKBA University coursework. In addition to certification tracks, the NKBA offers professional development opportunities through NKBA University courses. These courses are all offered through online and instructor-led options and include sessions in several different learning paths. The Iowa Chapter of the National Kitchen & Bath Association is offering a series of presentations to help local industry professionals understand the fast-growing and popular outdoor living market. Advance registration is highly recommended. The cost is $25 for NKBA members and $35 for nonmembers. For more information or to register, visit NKBA.org or email iowa.nkba@gmail.com.